If you handle a used needle or condom properly, there is no health risk. Teach children never to touch condoms or needles that they find, and to ask an adult for help. Don’t touch used needles with your bare hands. Wear disposable gloves or washable rubber gloves. Use tongs to pick up the needle. Take the container to the needle. Don’t carry the needle to the container. Do not hold the container when you put the needle into it. Close the container with a lid. Put the container into a garbage can that children cannot get at. Do not put it into a recycling bin. Wear disposable gloves or washable rubber gloves. Pick up the condom and put the condom in a plastic bag. Put the bag into a garbage can that children cannot get at. Do not put it into a recycling bin. Remove and dispose of disposable gloves. Wash rubber gloves. School Board staff should contact their Safety and Health Department for more information on how to get and handle sharps containers. Care providers can get hard-sided sharps containers at most drug stores, and there may be a charge. 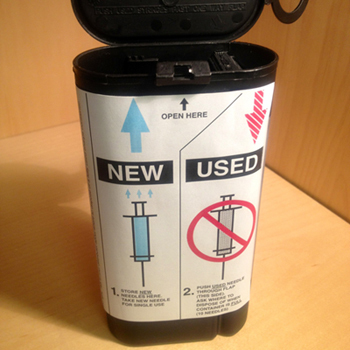 Drug stores will accept sealed, used sharps containers for disposal at no charge. 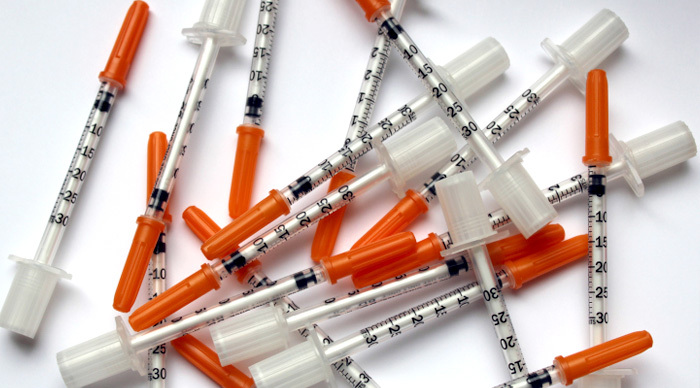 In Vancouver and Richmond, there are programs to arrange for pick-up of discarded needles. For other areas within Vancouver Coastal Health, please contact your local public health office for further guidance. Call Vancouver Coastal Health Communicable Disease Control at (604)-675-3900 for an assessment and advice. If you cannot reach someone in Communicable Disease Control, follow the protocol. What to do in case of an injury or splash happens to a child or staff member in a care centre or school setting. Don’t panic. The risk of serious infection is low. Allow the pricked area or wound to bleed freely. Do not squeeze it. Wash the area with soap and water immediately. Do not use bleach or alcohol as they will irritate the wound. Don’t panic. The risk of serious infection in a care centre or school setting is low. Rinse well with tap water for 10 – 15 minutes. Take the child to the nearest hospital emergency department as soon as possible. In Vancouver, go to BC Children’s Hospital. Report to your supervisor immediately. If you cannot do this, leave a message for your supervisor. Go immediately to the nearest hospital emergency department as soon as possible. For follow-up counselling, see your doctor or occupational health services department. Print these pages as featured in the guide book, Sneezes & Diseases: A Resource Book for Caregivers & Parents.